The article examines the developments that took place in Mongolia throughout the 20th century through the lens of democratic studies methodology and arrives at the conclusion of how these developments could be interpreted. In doing so, the author undertook a comparative analysis of the major Mongolian developments in the political sphere as manifested through a number of constitutions against the waves of democratisation on the international scene. Contested questions such as “When did Mongolia democratise?”, “Was democracy merely restored in Mongolia, or was it a new phenomenon in itself?” have been extensively dealt with in this article to provide concise answers for the students of Mongolian politics. The article strives to present to politicians as well as the wider public a concept of a shadow government being a potential effectual instrument to monitor the politics from inside, given the present context where political decision-making is insufficiently open and where there is a lack of the civil society monitoring of the above process. To put it simply, civil society means a collective of individuals who have the capacity to monitor the State and to hold the State accountable. Another suggestion that explains civil society is that it is a society where citizens do not strive to be the State, but strive to be the citizens. To conclude, civil society is a society where ordinary citizens are able to live as comfortably as they wish. It is, then, my opinion that, if we looked at the contemporary Mongolian society from the vantage of the last statement, civil society has not yet formed in Mongolia. The article amalgamates various academic opinions on civil society per se, as well as the models of civil society development, with a particular emphasis on women’s role in the process of civil society formation. Policy recommendations based on the social sciences methodologies, and specifically those of political science, may be developed in the spheres of examining the past and present historical development of countries, comparing the potential future trends to be reflected in the political processes, forecasting the essential features to be implemented. The comparison may be done through simple observation, a set of statistical data and real-life case studies, with the system and its component institutions, their values and cultures as the set methodological objects of the study. This time I have aimed to comparatively study three countries with certain similarities and differences, Hungary, Kazakhstan and Mongolia. The answer to the question “What exactly will be compared?” depends, on the one hand, on the structure and quality of the comparative study object, and on the other, on the study time frame and historical developments leading to the emergence of the study object. One of the preconditions to successfully implement the Government goals and functions, to make the public service accessible and immediate to the citizens is to ensure the Mongolian public service is staffed with highly educated and skilled personnel. According to the legal provisions, a citizen applying for a public service position for the first time will pass the public service professional examination whether she/he is applying for professional or support public service position. However, when there are vacancies in the public service management sphere, the vacancies are to be publicly advertised for a competitive selection whereby an authorised body conducts selection and recruitment of a candidate who fulfils all requirements. 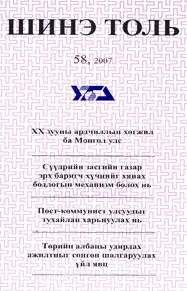 This article looks into the provisions of respective laws and regulations governing the process of recruiting professional public service managerial personnel for the state property and the legal persons with a state property share, for positions such as a member of board of directors, a president of the board of directors, and an executive director to fulfil the duties of a general manager. This article raises the questions of who a public servant is, what services they are able to provide for the citizenry, whether or not they are functioning within the ethical framework of the public service. Questions such as “What is the present image of a public servant in Mongolia? Do you have various worries, or are you able to work and live in a satisfied manner, carefree?” are constantly demanding their answers. On par with the positive issues, there are many negative issues we can no longer ignore. We have reviewed and unified various academic definitions and assumptions regarding strategy and strategic management, with some of our own clarifications and opinions. The present-day protective and oversized State (which is indicative of the weakness of the State machinery itself) is unable to solve immediate issues of social and economic nature, and it is furthermore doubtful whether it will be able, at all, to solve them in future. There is a necessity to make institutional changes in this regard, that is, to limit the scope of State interference in the economy, to promote private ownership, to protect property ownership rights through legal and structural (institutional) spheres, in short, to fulfil the preconditions of promoting the classical market relations development.